Keep an eye on our Facebook and Twitter in the next few days. There we will give you live updates on our adventure in Boston! The moment is (almost) there: the end of our crowdfunding campaign. Now, it's time to head for Boston, preparing for the grande finale of our project: the Giant Jamboree! Without your help our project wouldn't have been possible, so we would really like to thank you all for your support! Additionally, even some companies decided to sponsor our project, with an incredible result. Thanks to you all, our project has become a great success! We love you all to Mars and back! We, a group of ambitious students from Leiden University, need your help to build a garden on Mars. Mars seems within reach. NASA, for example, hopes to set foot on Mars in the coming ten to fifteen years. However, once on Mars, how will we survive on the planet? There is no food, and growing crops in the toxic Martian soil is not yet possible. Fortunately we are working on the solution. We will use bacteria to ‘clean’ the Martian soil. 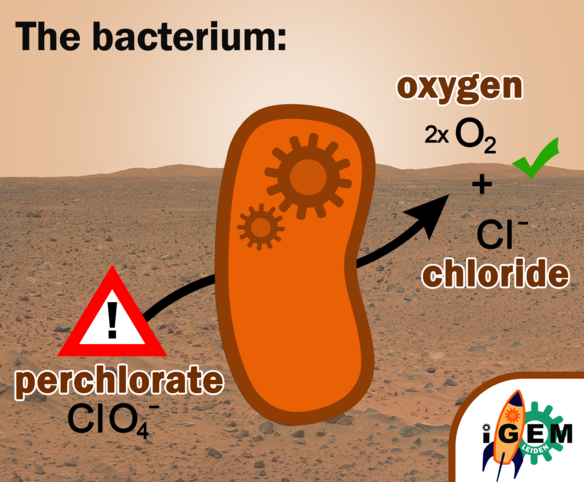 Martian soil contains the toxic compound perchlorate that affects vital body functions such as growth. Plants grown in Martian soil will absorb this toxic compound, making it unsafe for people to eat these crops. We will develop a bacterium, the E.colinizer which is capable of converting the toxic compound into other non- toxic compounds, including oxygen. With the help of bacteria we will provide two essentials needed for life: food and oxygen. Read more about perchlorate and our E.colinizer. Help our mission on Mars! To make our project a success, we need your help. Since this is a student-led and student-run project, we need to finance the project ourselves. To bring our experiments to a successful end, we need to finance materials such as simulant Martian soil. Another example is the Random Positioning Machine (RPM) which is capable of simulating Martian gravity. We need the RPM to be able to investigate whether our E.colinizer functions on Mars. We are asking for your help to raise €8,600.- to finance the Martian soil and other lab equipment. We are thirteen motivated students studying at Leiden University. We have different scientific backgrounds, ranging from mathematics to biology. We will compete in the world’s largest synthetic biology competition, called the International Genetically Engineered Machine (iGEM) competition, organized by MIT, Massachusetts Institute of Technology, a prestigious university in the USA. We have been working all summer on our project and in October we will present our findings in Boston competing for the ‘grand prize’. As a backer you will get a special place in our digital Backer's Garden. 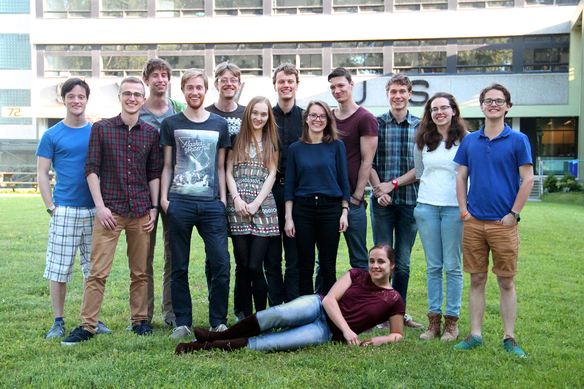 Pay our garden a visit at: http://2016.igem.org/Team:Leiden/backersgarden Our website is currently 'frozen' for judging, but as soon as it is editable again at the beginning of November, we will still plant your seeds! 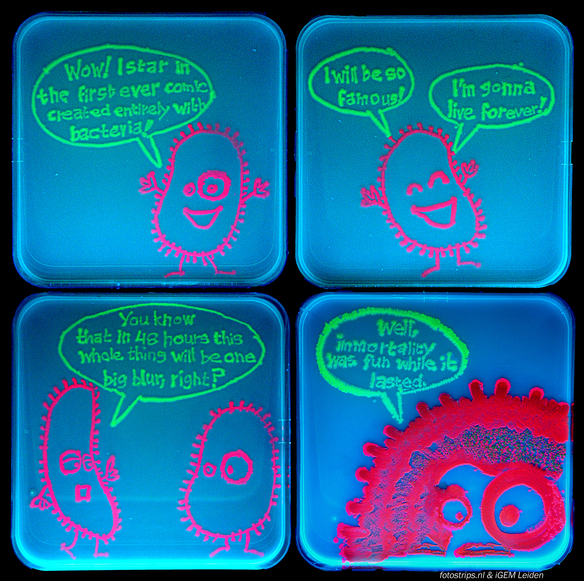 The world's first comic made entirely out of bacteria, designed for us by fotostrips.nl since bacteria are not only useful, but can also be a lot of fun! 25-10-2016 | 14:21 DSM .